new NSC Planning Application System here. Granted due to lack of NSC/BPC monitoring? For associated mapping and policies visit the Major Developments page on BOB. 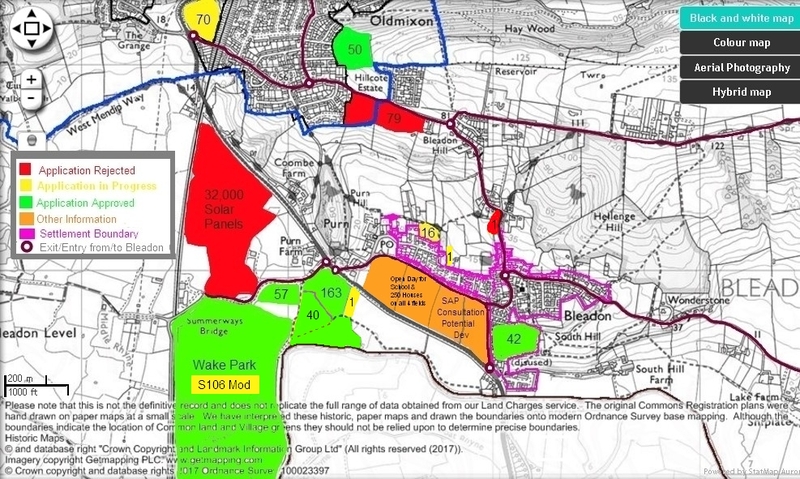 NB: The Quarry development is the only application inside the Settlement Boundary. Last year during the Bleadon Hill Public Inquiry, 5 Dec 16, BOB wrote to BPC asking several questions relating to the development in and around Bleadon, referencing and asking for a copy of the adopted Bleadon Parish Plan and associated documents, asking whether BPC would present at the Inquiry and for their 'vision' for the future of Bleadon. BPC did not answer our queries but instead invoked their 'draft' Vexatious Policy against us for six months. So, it appears we may all have to wait until at least 18 Sep 17 to start receiving answers as it seems their policy enables BPC to avoid answering key questions for this period of time. Unfortunately BPC haven't told us which questions they are not answering, neither are they resending the replies to any they think they have answered including how they see the Future of Bleadon? NSC have suggested that our Parish Plan be submitted again as a Supplementary Planning Document, as do CPRE. Seek additional or alternative public recreation space Open negotiations with landowners and developers New recreation space must accompany any future major housing development Developers and Section 106 funding BPC + NSC"
(Q1) "Please can BPC/NSC inform us as to what has happened to the (adopted 2009) 20 year Parish Plan progress and monitoring, why NSC do not appear to know anything about it, and why it appears not have been used as evidence in this and the other major planning applications submitted in recent years? (e.g. Weston Wake Park, Solar Farm, Quarry, etc.)" BPC did inform us after the Inquiry, 6 Jan 17, that they "have no electronic record of the Parish Plan nor the Strategy and Financial plan...We have not found these documents so far". At the 10 Apr 17 Annunal Parish Meeting Open Forum we asked once again when would the public be informed of its loss, BPC responded with somewhat contradictory information E.g. "Once more District Cllr Porter said that Parish Plans cannot be introduced, or contribute in any way at planning hearings. He said that they have never been able to carry any weight, [contradicting what we were told by NSC representatives at the hearing and previous BPC correspondence?] and there (sic) only use is to demonstrate the wishes of the Parishioners. The Clerk was asked why it had not been made public that the Parish Plan could not be found. He replied that the only person who had ever enquired regarding the Plan was the person posing this question, who had been previously told that it could not be found. If the Plan is found then it will be made immediately available. Cllr Hartree suggested that as it was clear that the Parish Plan would carry no weight at planning hearings then the Parish Council would not spend any more time discussing it." This does raise the question that if the previous, and current five, councillors have never read the 'lost' Parish Plan which represents the views of 60% of residents, costing thousands of pounds to create, then what have they basing their decision making on, and how are our representatives deciding the future of our rural community? (Q2) "Please can BPC/NSC inform us what is the purpose of the Settlement Boundary and how it relates to development applications? How does this (any) covenant apply? What is being done, or can be done, to protect Bleadon Parish's rural and village environments and way of life from repeated development applications, including encroachment into the extremes of the parish now, and for future generations (e.g. existing and future applications/licences on the Bleadon Levels for dwellings, businesses, solar energy, fracking, etc.)" July 2017 Settlement Boundary Information update. (Q3) "Please can BPC/NSC/Central Government inform us as to how they can ensure that these critical [health] services will be in place before people start inhabiting the developments and need to use them? How can 'we' help to protect our current and future health and well-being?" (Q4) "Please can BPC/NSC inform us of what is being done, or can be done, to protect our Parish Boundary from neighbouring development pressuring 'us' to accept addtional development? How do BPC/NSC balance short term job creation via development vs long term environmental damage? How can we all work together?" (Q5) "How is NSC/BPC protecting our environment, water and air quality, health and well-being from these types of application? How is it working with neighbouring parish/town/district councils/government and related public? How can 'we' build on recent hearing/inquiry knowledge, experience and general interest to enable the public to officially and successfully interact with the process?"